I find myself growing increasingly disturbed by the commercialization of "the alternative." What was once non-conformist has become totally generic. There is now a Williamsburg in every city. Newly 'revived' places considered desirable because they are 'eclectic and liberal' have become the familiar. We've returned to a time where Americans believe that looking and behaving a certain way will make them happy. But instead of a having a nuclear family and a white picket fence, we're all "creative," we eat at hip places, we travel, we wear vintage, we buy artisanal everything. Of course this cultural phenomenon is a reaction to mass production and the utter destruction that the past few decades have inflicted upon humanity and the environment, but we've effectively replaced a blind acceptance of Betty Crocker products with a blind acceptance of gluten free products. Only I find it worse now, because today we all know that advertising plays into our subconscious, we know that everyone's internet lives are curated, and yet we consume the new standard, believing that doing so can make us 'different' from 'everyone else.' (Not to mention tons of people and brands are simply repeating the work of others and parading as if they're original). And yes, farm to table restaurants and organic foods are wonderful, it's important that we consume more consciously, but I'm starting to think modern society is a throwback to the 1950s, but this time around everyone's in indigo; and consumption, though less corporate, is far more commercial because we're all a brand. We're all patrons of propaganda. Nearly everyone has a website. 'The individual' is a consumer product, and quite frankly I'm calling everyone's bluff (hence the rant). But instead of getting too upset and turning on humanity, I've decided to study a period in history where similar sentiments were turned into art. When thinking of artwork that reacts to my current woes, Germano Celant's "Manifesto" for the Arte Povera movement comes to mind. In the manifesto titled, Arte Povera: Appunti per una Guerriglia (Notes for a Guerrilla War), the opening lines state, “First came man, then the system. That is the way it used to be. Now it’s society that produces, and it’s man that consumes.” Using language that was political and revolutionary in nature, Marx and a "rejection of consumerism," Celant's manifesto was a social critique. This manfiesto was first published in Flash Art magazine in 1967, after the group's first show, and is now considered to be the launch of the short-lived Arte Povera movement in Italy, a movement which lasted through 1972. 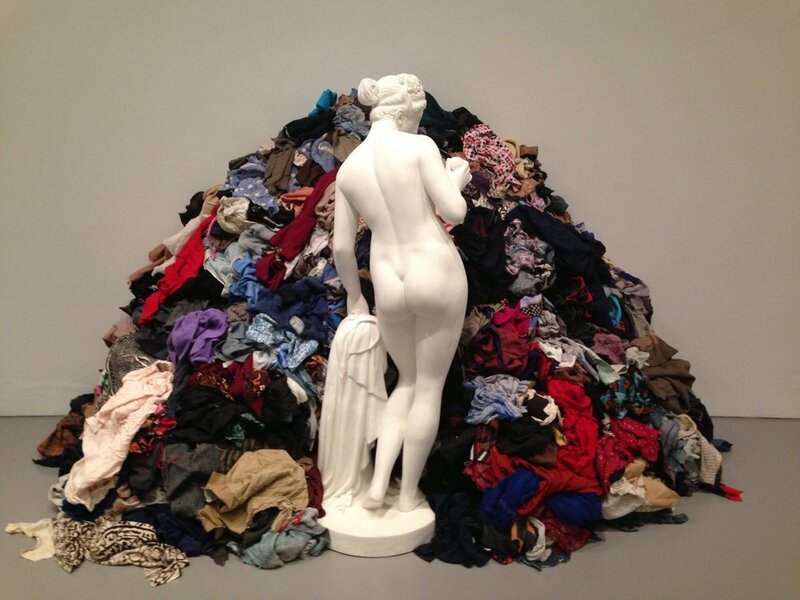 The name 'Arte Povera' literally means "poor art," and was adopted because the artists worked as a group to counter 'high art,' criticize capitalism, class struggle, and the commercialization of fine art by using "poor mediums." At a time when art was being produced in an industrial fashion (think graphic design techniques used in pop art processes, for example), and abstract minimalism had overstayed its welcome, dominating the market to the point where it was no longer cutting edge, but had become palatable for every day consumption, postminimalist artists emerged in Europe and the US. 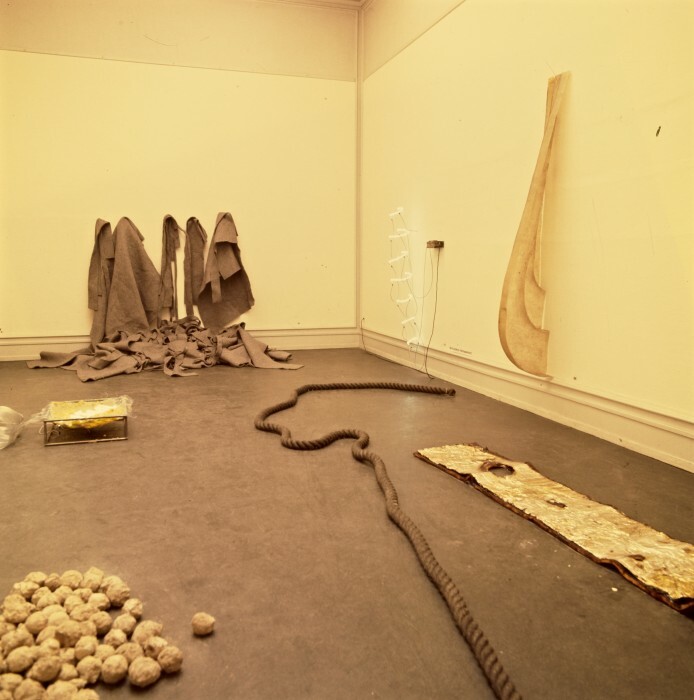 During this time, Arte Povera artists made use of ordinary objects such as rope, plaster, metal, soil and wood as mediums, shying away from traditional, rigid art forms, since the latter were thought to be concerned with emotion and individual expression. 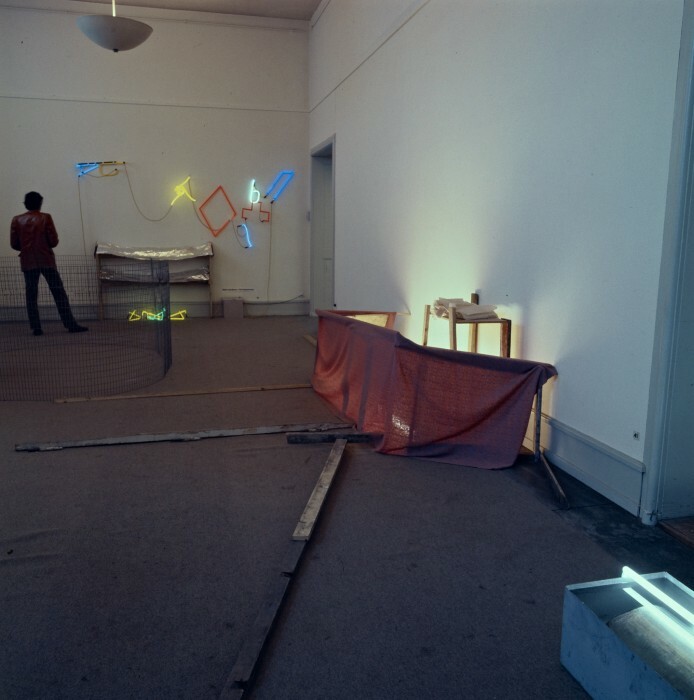 In a sense, this movement was Italy's specific type of postminimalism because performance, process and land art were applied to create installations, but how they differed from artists working with similar mediums and likeminded agendas elsewhere, was that Arte Povera emphasized the rejection of consumerism and the branding of the artist. L-R: "Shaman Showman," Alighiero Boetti, 1968; "Che Prendo il Sole" (I sunbathe), Alighiero Boetti, 1969; "Che Fare?" (What to Do? 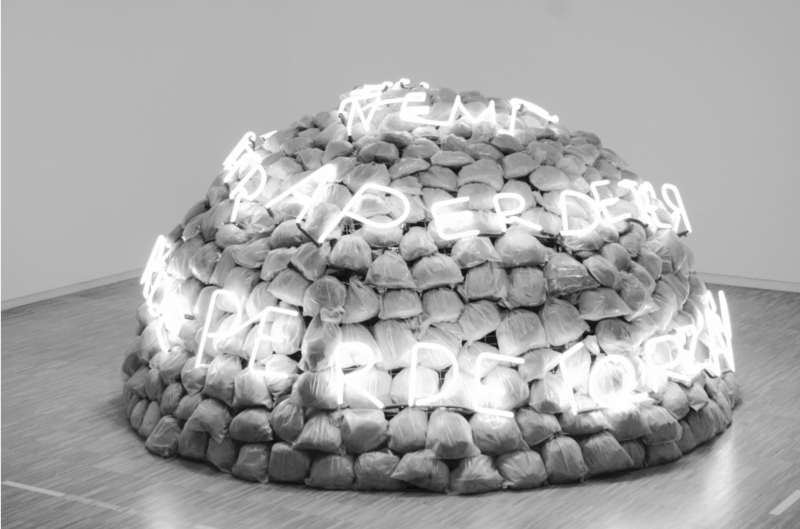 ), Mario Merz, 1968; "Igloo di Giap," Mario Merz, 1968, reads: If the enemy concentrates, he loses ground; if he scatters, he loses force. 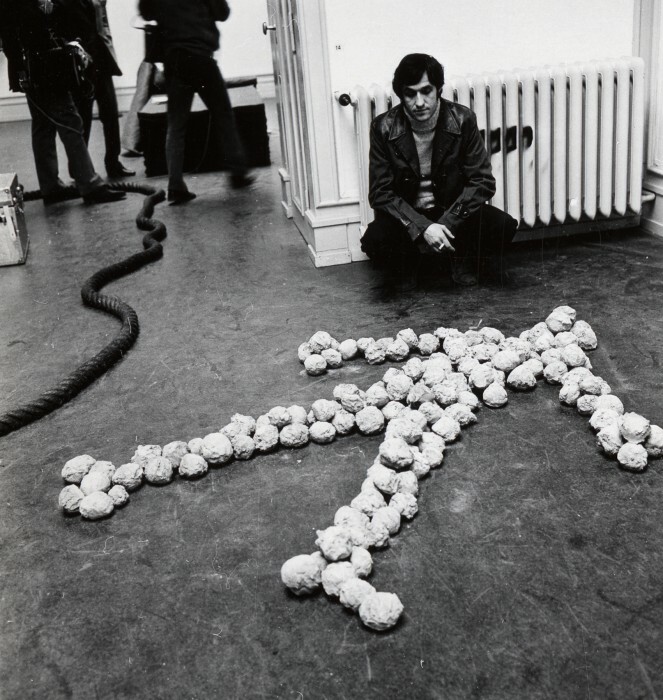 In effort to curb the emphasis on the individual, Arte Povera exhibitions were formatted in such a way that it was difficult to distinguish each artist's work, completely undermining the conventional gallery format that traditionally brands an artist to make their work ready for consumption. 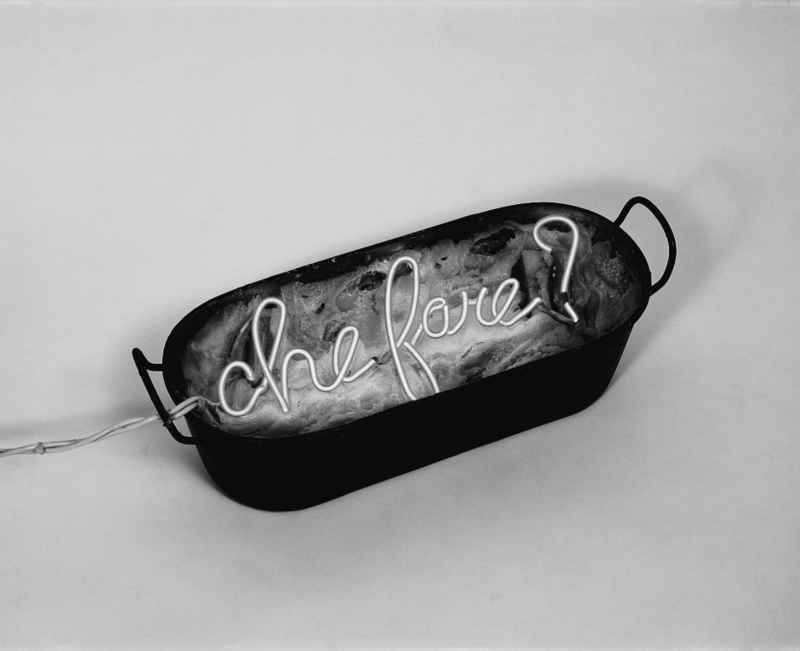 With interest in creating a dialogue between art and the viewer, where the viewer is free of preconceived notions, the Arte Povera exhibitions aimed to form a different experience of the art on display. By using familiar, everyday materials in a gallery setting, this goal was further solidified. Hence viewers were left with only the materials, the forms in which the materials were put together, and often, words one would otherwise find in combat or revolution propaganda, without being spoon fed the meaning, the need to consume the art, or branded artists. While it is difficult to say whether or not Arte Povera's attempt to remove a brand from their art was achieved, (I mean, they gave it a name and worked within certain parameters), I think it is more important to overlook the trend of the "fly on the wall" method that most artists and academics were adopting at the time, to focus on Arte Povera's call for attention to consumerism and branding in general. Considering Arte Povera was in a sense, a reaction to the homogeneity of the Post-War West that went on in the 1950s, I think my comparison of our society today with the 1950s again shows a need for awareness of the blind consumerism and branding our society participates in currently. Bagtazo isn't a brand. It's a name I have given to the work I create. And while the aim is to make a living from my work, I've been really giving thought to how I would like to go about doing that moving forward. Because ultimately the success of Bagtazo relies on you. The consumer. I can make beautiful things, but I can't live from making them without you. At a time when so many people have 'start ups,' the economy is basically in the hands of the people in a way that it hasn't been in the past 50 years or more. So maybe if we put a little thought into how we're consuming, how we're selling (and let's take it beyond caring where it's made or buying into the ubiquitous stories people tell up about how the brand was born from sunshine or some heritage nonsense) and really put some thought into how and what we're consuming, perhaps we can insight the revolutionary air of the 1960s once more. After all, I feel like we've been living in the 50s lately, so maybe there's only one place to go from here... who knows.